If possible—do not leave your instrument anywhere cold. When not in use, always make sure your instrument is stored in it’s case. If your instrument was in a cold place such as a bus, car trunk, or any unheated environment you will want to make sure it has had time to acclimate to a warmer environment. Once inside, keep your instrument in an area that is room temperature—do not place it near a vent or radiator. String instruments such as violin and cello will be damaged if exposed to extreme changes in temperature. The most common issue to arise in string instruments are cracks in the body and seams coming apart—both of these issues can render your instrument completely unplayable. The dramatic temperature changes can also cause the strings on the instruments to unravel because the body they are attached to will swell when warm and shrink when cool. Make sure to check your strings and tune the instrument properly before playing. For woodwinds, take the instrument out of the case and blow warm air through the bore of the instrument. Once it is warmed up you will be able to play without issue. Playing a wood instrument immediately after bringing it in from extreme cold is exactly like pouring boiling water into a frozen glass—it WILL crack! 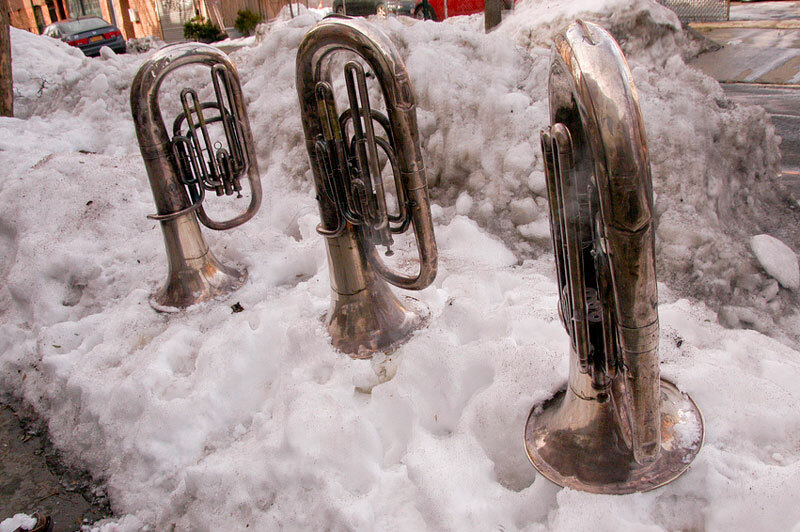 Most brass instruments are less susceptible to damage from the cold. The biggest issue that arises is moveable parts such as valves and tuning slide being stuck due to moisture freezing within them or the different components sticking from the brass swelling and shrinking. Let your brass instrument sit in a warm environment and blow warm air through the instrument to warm it up before playing. If you believe the harsh weather has damaged your instrument in some way—please don’t hesitate to contact our repair department and they will make sure your instrument is in proper working order.